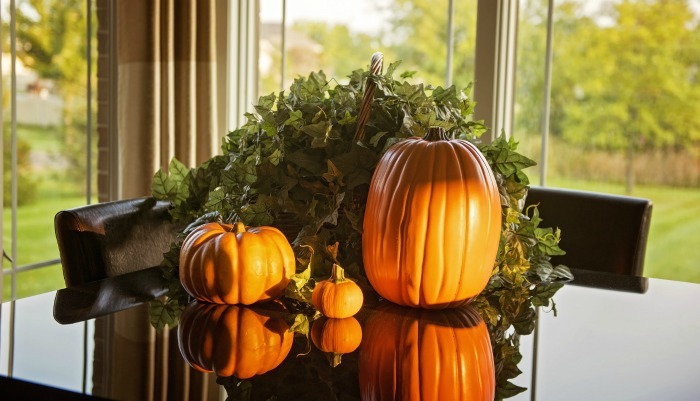 It’s time to welcome autumn with these tips for fall decorations. 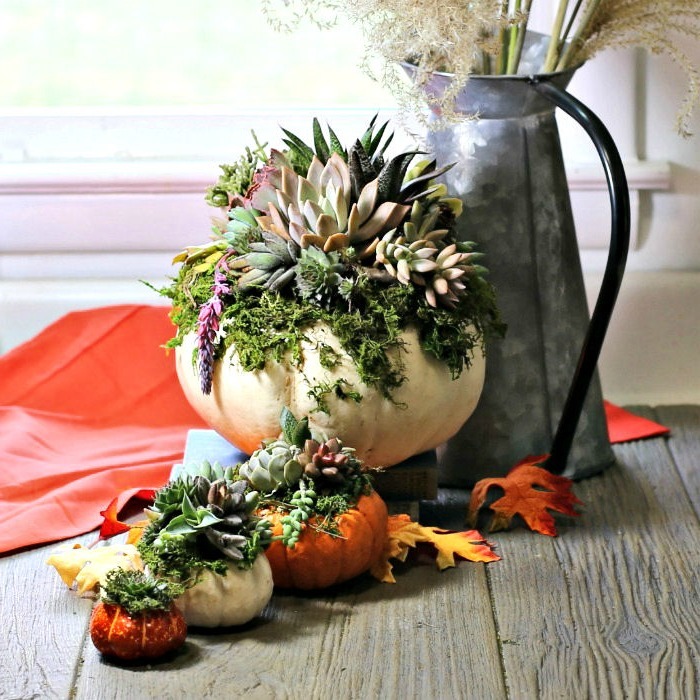 From easy and simple porch and patio decor and wreaths to table decor, these autumn decor ideas will say hello to the new season in all areas of your home. I love the last change of seasons during the year. The sights and textures of nature are so vivid and bright when autumn color arrives that they easily lend themselves to fall decorating, both indoors and outside the home. Outdoors, fall color means having some blooms that flower this time of the year. Lovely colors of red, rust and yellow seem to be everywhere. For me, the key to fall decorations is keeping them simple. I know that in just a few months, I will want to decorate for Christmas in style, so I don’t want to spend a lot of time just a few months earlier. But I still want a great look, so making the most of what nature offers me makes the most sense. I can forage around my yard and come up with items that can be quickly assembled to achieve a festive look without a lot of time. 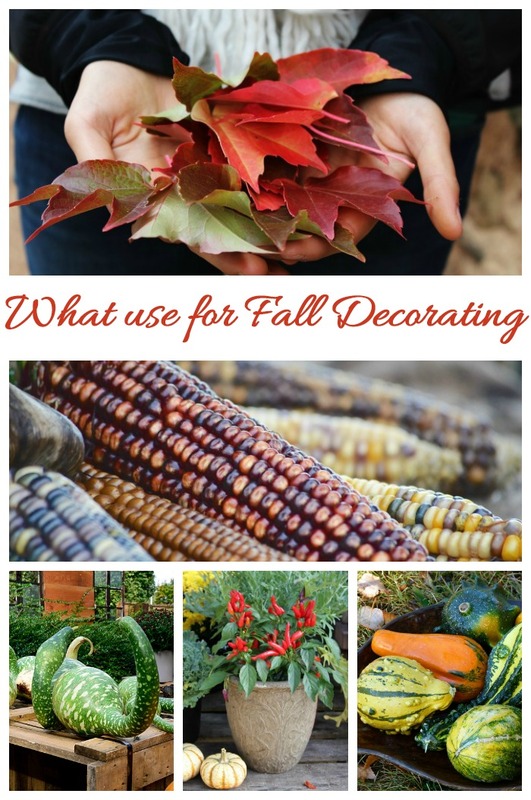 I have put together a whole post that gives suggestions for items in your garden to use in fall decor projects. You can check it out here. Getting a wonderfully festive look for autumn is easy with these tips. Why not put a few of them into practice to make your yard and home a warm and inviting place this fall? 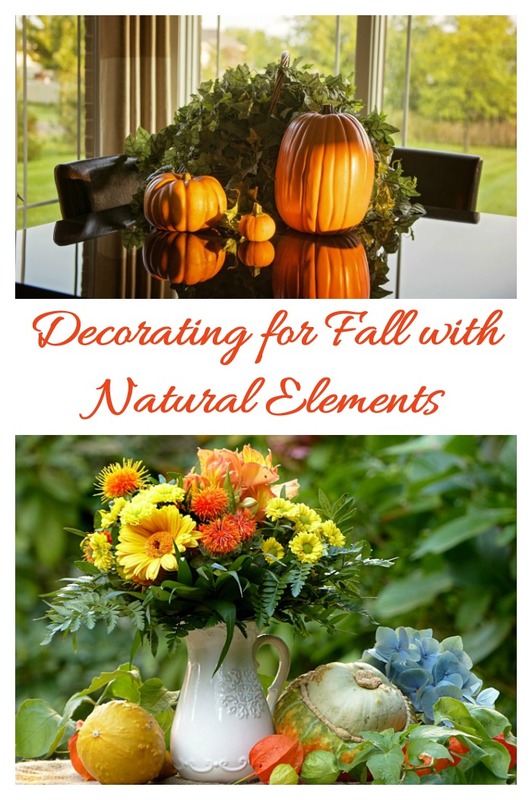 These DIY fall decorating ideas all make use of nature’s bounty this time of the year and are quick and easy to put together. 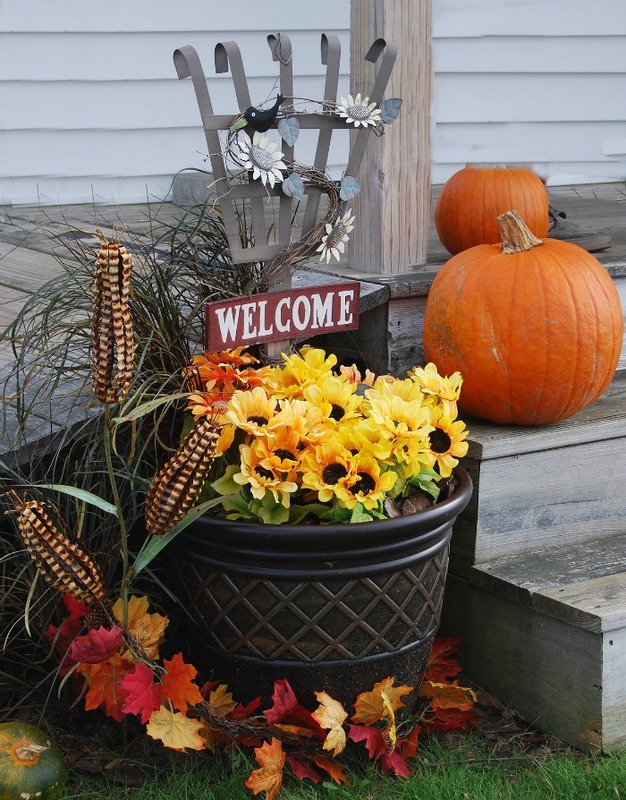 From your driveway to the patio and garden beds, the outside of the home offers many areas that you can use to assemble outdoor fall decorations. The key is thinking out side the box to make use of common household items in a more decorative way. 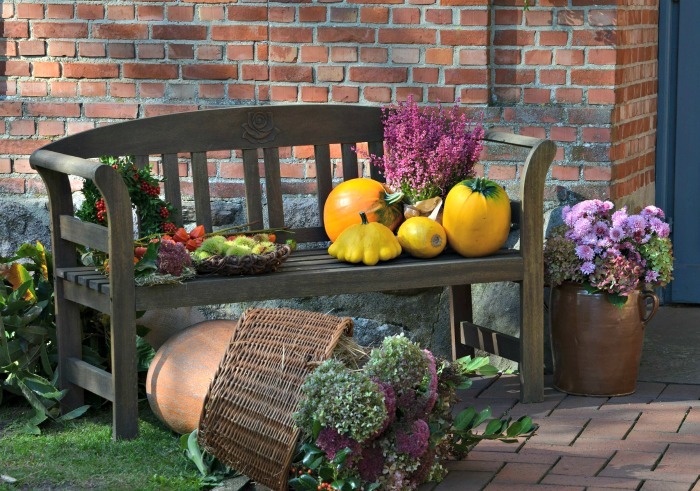 Here are a few tips to make your outdoor area welcome autumn. I have seating areas in all of my garden beds. I enjoy admiring the flowers and taking a break from gardening work. But benches and chairs can also easily be incorporated into a decorative theme with the addition of a few pots of flowers and some artfully placed decor items. Wooden benches naturally lend themselves to a display. Just add some garden mums, a few pumpkins and a rustic basket and you will have a fall display that looks carefully planned, but actually takes just minutes to put together. Do you have a garden bed near a pathway? 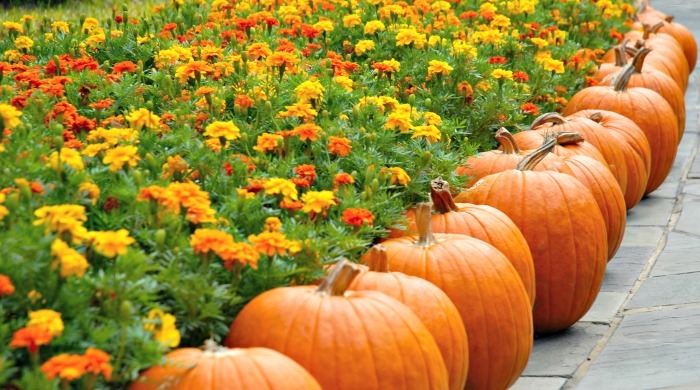 Plant colorful marigolds or chrysanthemums in pretty yellow and orange colors and line the whole bed along the path with pumpkins. The effect coordinates the two colors well and gives structure and form to both the path and the garden bed. A plain wall can be transformed in just a few minutes with a flat backed wire basket filled with sphagnum moss and small gourds. This idea could be used on wood siding, a garden wall, a shed, or even your shutters (if the basket is smaller). The look is rustic and so appealing. 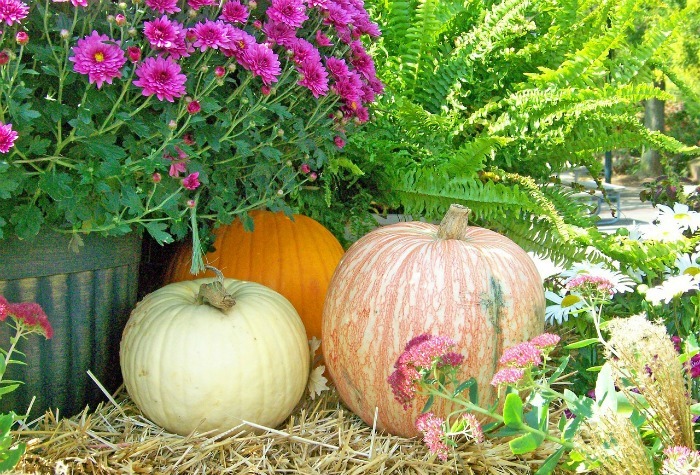 Vary the colors of the gourds and try to use height and texture for the best look. Pumpkins covered in moss make the great base for small succulent cuttings. They will even root and can be used later for individual plants! See how to make this fun pumpkin planter idea here. Fall is also the time for apples. 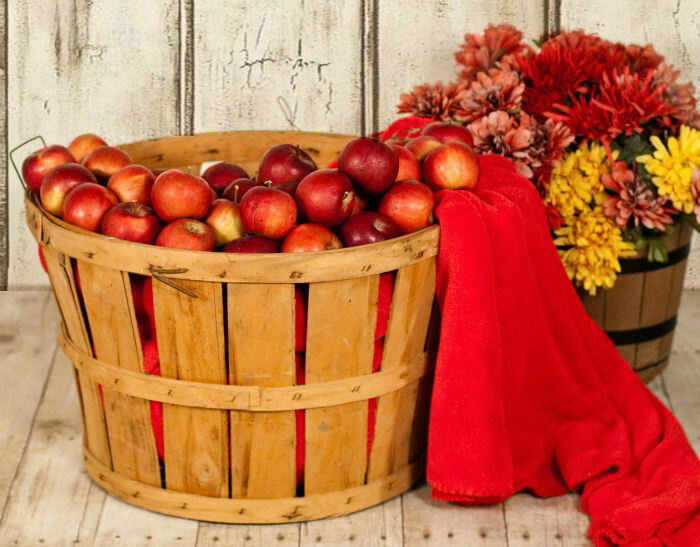 Make use of this tasty fall fruit by using apple baskets as display props. In this display, a basket or red apples pairs up with a haphazardly placed red cloth and a small barrel planter of colorful dahlias and mums for a simple display that looks great against the plain wall backdrop. The corner area where the house wall meets a fence is often ignored, but can be used to give a contrasting backdrop to any fall vignette. In this scene, the back drop is a combination of brick and wood. 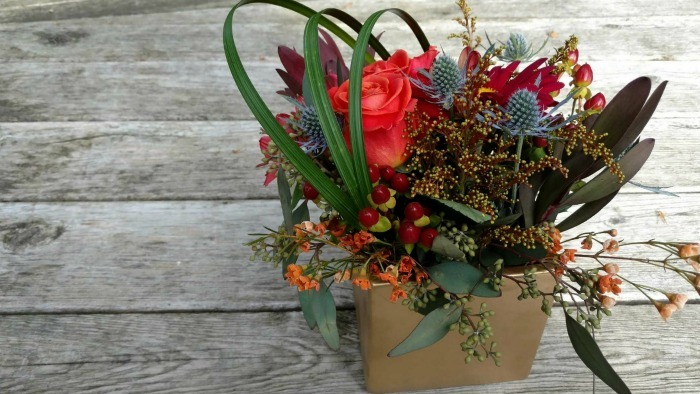 The rustic colors are perfect to showcase the simple basket of flowers, a wooden lantern and some pumpkins and gourds. A couple of pieces of cut wood finish out the scene. 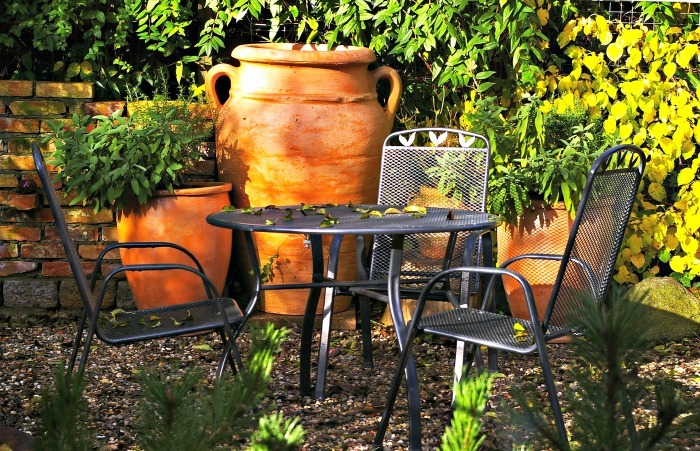 Terracotta pots have a natural orange color that lends itself to a fall theme decoration scene. The only thing this scene needs to turn it into an autumn display is a faux pumpkin to place in the middle of the metal table and some colorful fall plants to replace the green ones in the urns. In 10 minutes, you’ll have the perfect place to sit and enjoy the fall weather. To keep your clay pots in good shape, be sure to check out this article to learn how to care for and clean them. Pumpkins are not just orange. They are grown in a wide variety of colors the will coordinate well with the other greenery in your yard. In this display, peach, white and orange pumpkins are displayed casually on a bale of hay near some purple mums, yarrow and a Boston Fern for a great look that takes all of 5 minutes to put together. 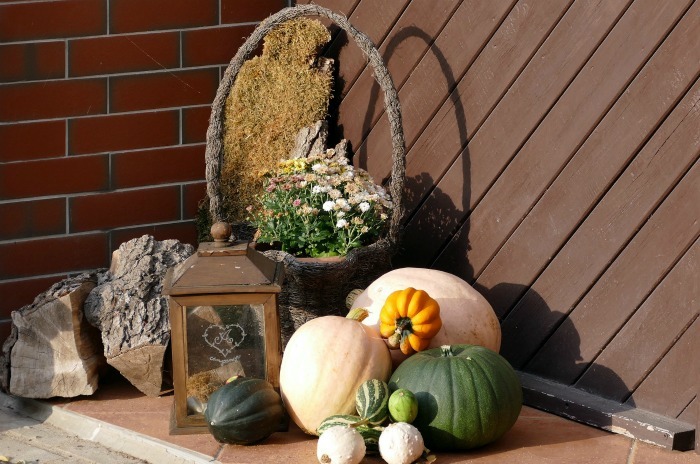 Porches are the ideal place to arrange fall items. This is the first area that visitors see when they arrive at your home and a pretty fall scene really does a nice job of welcoming them. in this pretty scene, some faux leaves, Indian corn and sunflowers are quickly arranged in a large plant pot. A small welcome sign and cute rake trellis adds to the fall look. Two orange pumpkins use the steps of the porch to add some height and relief to the scene. Halloween comes right in the middle of autumn and lasts just one day. This cute snake basket will scare the trick or treaters in a fun and whimsical way. 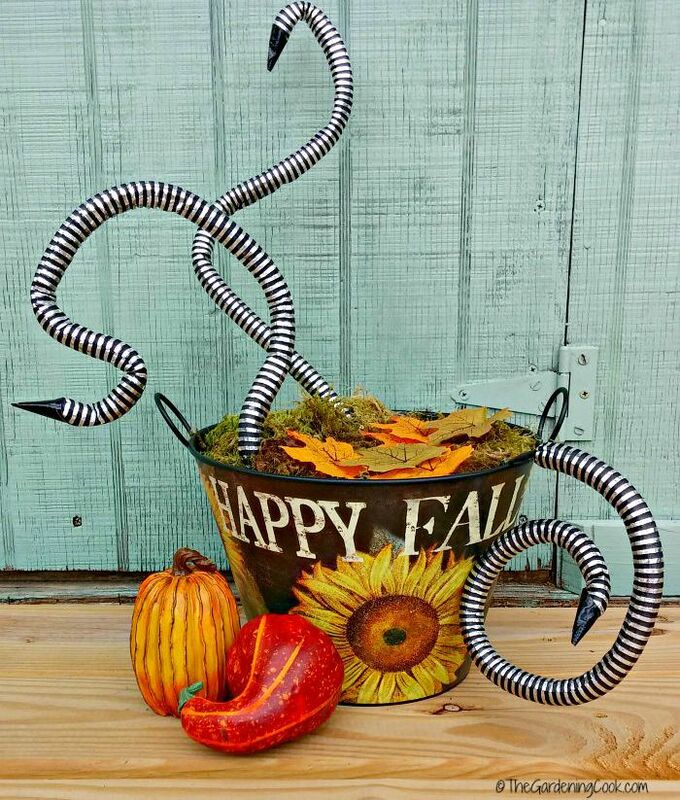 When Halloween is over, remove the snakes and fill the basket with some fall flowers to keep the look going through autumn. The project is very quick and easy to do. See the tutorial for the snake basket here. 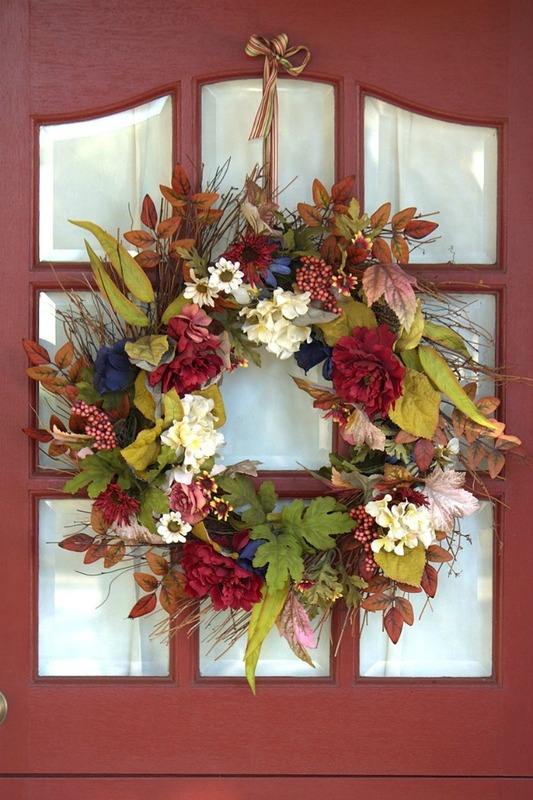 When guests walk up to the door, a pretty wreath will be a cheerful greeting. Adding some decorative fall items to a grape vine wreath will quickly give a great look to your front entry. Fall door decorating always puts me in the mood for the seasons of decorating to come in just a few short weeks. This pretty wreath coordinates to the color of the door beautifully with a great combination of faux greenery. You could get a similar effect using some natural elements as well. Don’t leave the decorating at the front door. The inside of the home can easily be transformed with fall greenery to keep the theme going. Side tables, mantles and your dining room table are all great places to set up some fall scenes indoors. Any plant pot or square container will hold your greenery and give you a great look. 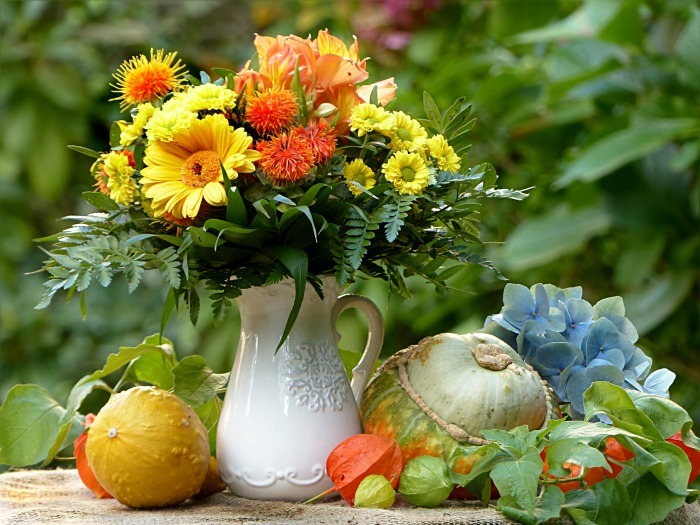 Just add some oasis and start arranging your choice of flowers and fall decor items. Choose dark colors for a fall look. This display uses long dracaena leaves in a curve along with berries, roses, seed heads and other flowers for a rustic look that would be pretty on any side table. 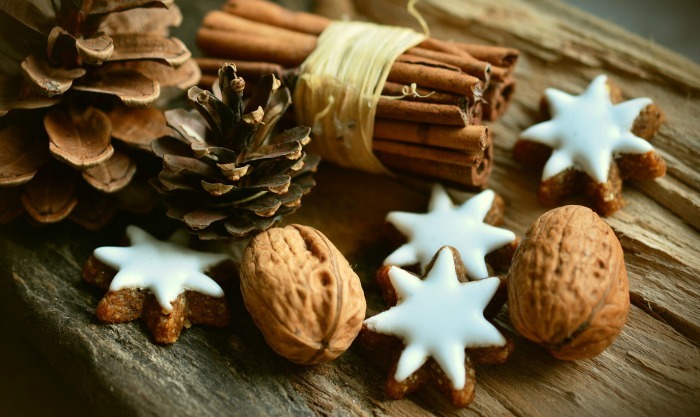 Grab a rough plank of wood and arrange some pine cones, walnuts and cinnamon sticks wrapped in jute on top of it. Freshly baked cookies in the shape of stars complete the rustic look that would be delightful in the center of a dining room table. This pretty table vignette uses a milk pitcher filled with yellow and orange flowers and fern leaves. At the base or of the pitcher, arrange some gourds, a large hydrangea flower and some Chinese Lantern flower pods for a pretty fall look. This pretty display would make a great table centerpiece and has a still life look to it. Rattan baskets of all sizes can easily be filled with fall items to make a quick and easy display. 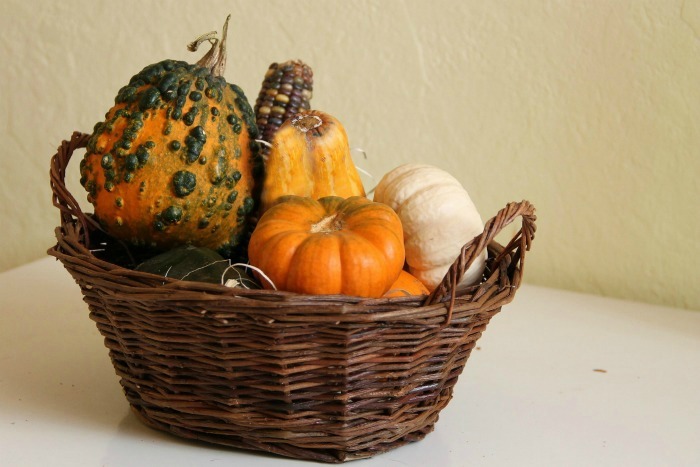 This brown basket with handles is quickly filled with gourds for a last minute centerpiece idea. 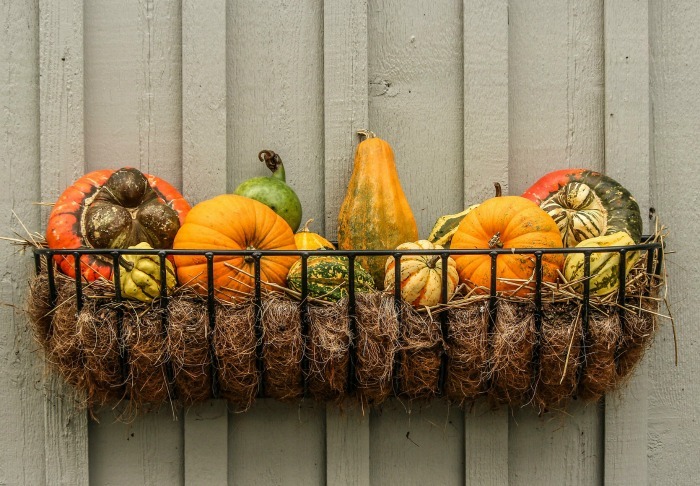 For best effect, combine different colors and choose gourds with lots of texture to give some dimension to the basket. Faux pumpkins have gotten more and more realistic over the years. In this lovely display, a basket of ivy forms the back drop for three faux pumpkins for simple fall table decorating. What I love most about this look is the shine on the table. It gives the whole look a doubled up effect that is so pretty! Need some inspiration for your fall decor ideas? Just walk out doors! The beautiful colors of fall abound in nature. 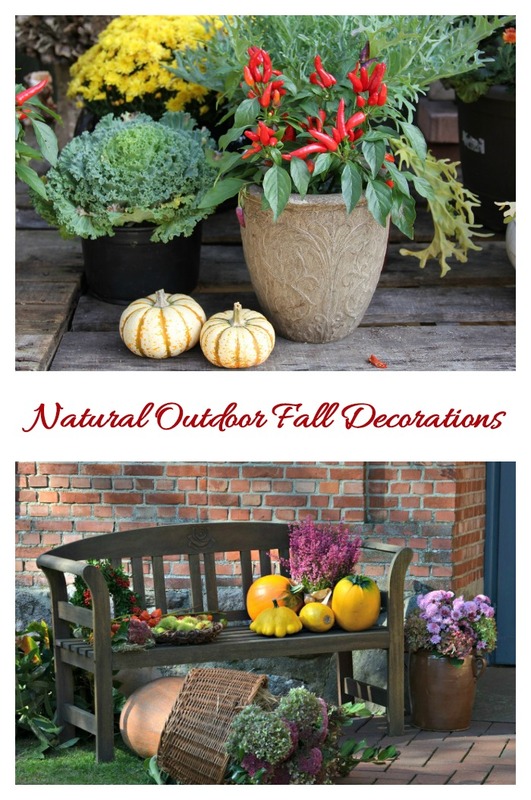 Try using some of these items in your fall displays, both indoors and out. You can choose from natural items, or browse the craft store for some faux items that will give you the same look and can be used from year to year. Now it’s your turn. 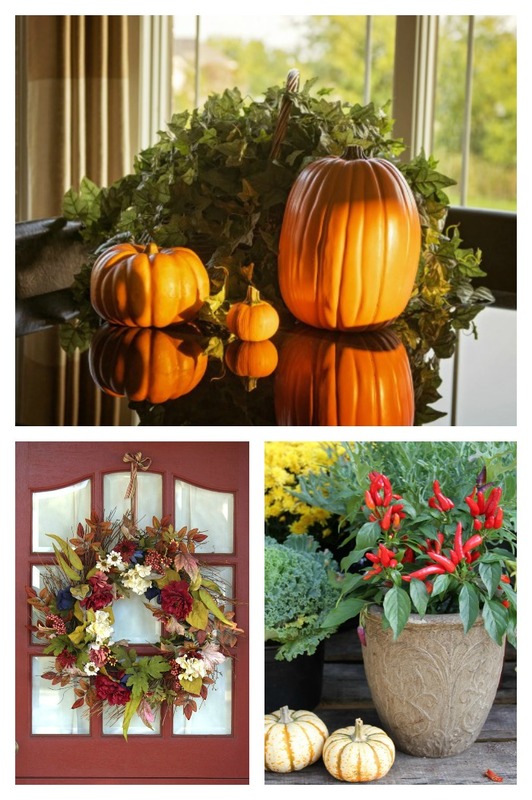 Do you have an idea for a quick and easy fall decoration that you’d like to share? Why not upload a photo of it to the comments below so that others can get some inspiration? 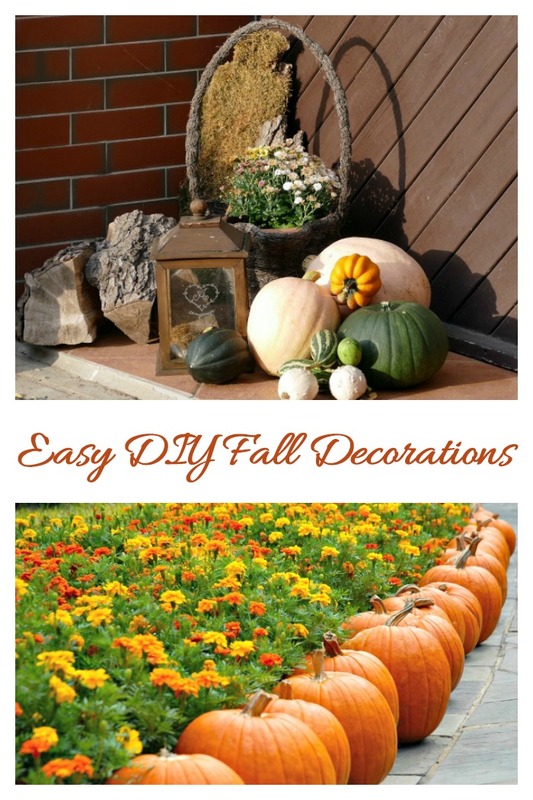 To remind yourself of the ideas in this post for easy fall decorations, just pin this image to one of your Pinterest decorating boards so that you can easily find it when fall arrives. I like that you suggested using a rattan basket since filling it with items easily makes it a good decoration. I will buy one for my mom as a gift for her newly constructed garden. She started planting last Sunday which really made her excited an busy for the whole day. She was not able to eat Sunday roast with us because of that. It sounds like she is really enjoying her gardening project!